Railpictures.ca - Bill Thomson Photo: A CN derailment in May 1997 forced a few CN trains to detour over CP, passing through Smiths Falls. This resulted in a few scenes of mixed CN, CP and VIA trains together. Here, CP 5662 and CN 5335 (with CR units trailing) are seen heading up two westbounds by the platforms at CP Smiths Falls station. | Railpictures.ca – Canadian Railway Photography – photographie ferroviaire Canadienne. 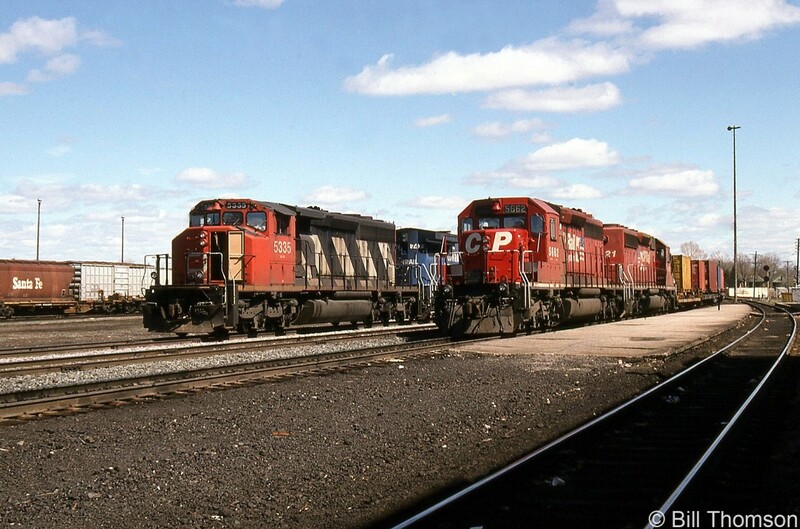 Caption: A CN derailment in May 1997 forced a few CN trains to detour over CP, passing through Smiths Falls. This resulted in a few scenes of mixed CN, CP and VIA trains together. Here, CP 5662 and CN 5335 (with CR units trailing) are seen heading up two westbounds by the platforms at CP Smiths Falls station. Derailments..not fun..but how to benefit from them. Nice catch Bill with a Conrail unit to boot! Was it a leaser or pooled?